Eszter’s Blog » Blog Archive » What makes a town a town? What makes a town a town? I’m now on on the West coast after spending a chunk of last week driving to Palo Alto from Chicagoland. * I didn’t have much time so I just got on I-80 and drove with few interruptions. I made a stop in one of the more populated parts of Wyoming: Buford. As you can see from the sign, the town has a population of two. It’s also noteworthy due to its high elevation, apparently the highest on I-80. I had no idea I was that high up had it not been pointed out on this sign as the roads on the way weren’t particular steep. In any case, I am curious, what makes a town a town? The Eisenhower Expressway (I-80) goes by plenty (more than plenty, in fact) unpopulated areas with just a house here or there. 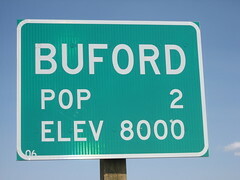 So what makes Buford a town of two vs just a house attached to another town? [*] For those not familiar with distances in the US, this is similar â€“ in terms of distance, pretty much nothing else â€“ to something like driving from Moscow to Madrid. This entry was posted on Wednesday, September 13th, 2006 at 4:48 pm	and is filed under Photos, Travel. You can follow any responses to this entry through the RSS 2.0 feed. Both comments and pings are currently closed.